Brrrrrrr! It is cold at 7 o'clock in the morning. I'm not sure what the final count is for our team membership but 21 women showed up this morning for our first MIM team workout. Hooray! We've officially started our training program. Introductions were made and it was great to see so many returning members and so many new moms as well! The first team workout so far has been a timed mile, later as we get closer to race day, Wendy will time us again so we can see how much we've improved. This was a very rewarding experience for me last fall - I started at an 11 minute mile and re-tested at 9 minutes. This morning however was not so rewarding. I haven't been running since the first week in December and I finished the mile at 11 minutes 40 seconds with a side cramp! Oh well, Wendy always says, "Start where you are not where you want to be." Perhaps she should add, "not where you used to be." Aaron assures me I'll get back to where I was quickly because of my previous training. I hope so! Some other exciting MIM news: our friend and team mate, Aly Viducich, was chosen to be our teams' SuperMom! I'm so excited for her! You can read her interview on her blog and the MIM website. Check it out! StrollerFit and its’ founder, Mary Beth Knight, has been entered in StartupNation’s Leading Moms in Business 2009 Competition! This is a competition celebrating America’s top 200 Mom-owned businesses and the women behind them. All of us StrollerFit mommies around the nation would love to see StrollerFit rank high on the list! You don’t have to be a member of StrollerFit to vote, anyone who has seen the difference StrollerFit has made in the life of a friend or loved one can go online and cast a vote. Also, you DO NOT have to input any personal information. Just click on the pic below. It will take you to the website and StrollerFits’ voting page. You may vote once a day, every day now through the end of April. So be sure to add it to your Favorites Center! Winners will be ranked in order according to votes accumulated. Winners will be announced in early May, 2009. This is so exciting - I'll be voting every day! We recently had a play date with our girly-girl friends, Aly, Taylor, and Hailey, at the local Color Me Mine. Owen LOVES to paint. I didn't have anything in particular in mind so I asked him to choose what he would like to paint. 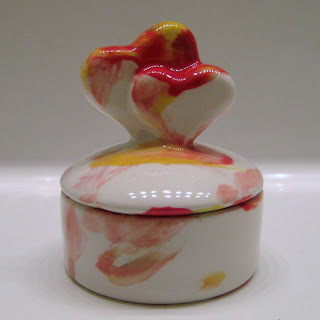 He chose this little trinket box with hearts on top and said he wanted to paint it for me. Someone get a mop 'cause I just melted into a puddle of mama goo. Fast forward to painting at the table. I'm watching my adorable son haphazardly glop paint on this little box and I'm thinking to myself, "So this is it, the first of a lifetime of knick-knacks and other random gifts I'm going to have to find a place for." 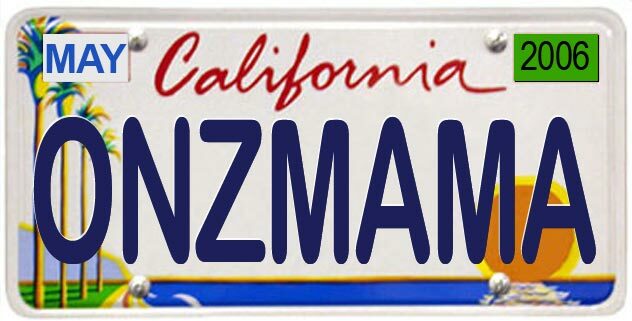 Fast forward to pick-up day. We walk into Color Me Mine and there are three moms with small children painting and a late teen/early twenty something girl behind the counter. I hand the girl behind the counter my pick-up ticket. When she emerges from the back room with my little box I immediately tear up exclaiming, "It's so beautiful!" Get the mop I've melted into mama goo again! I go on to tell everyone in the store that my son picked out this box and painted it for me, sniff sniff. 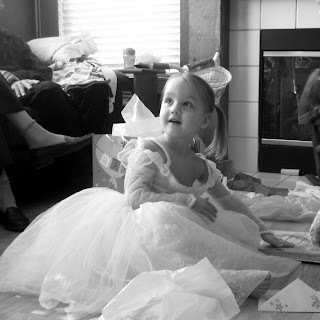 The moms in the room nod and smile knowingly while the young girl looks at me like I'm nuts! 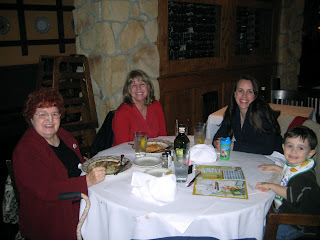 What can I say - It's a moms' life! Saturday, January 31st is the start of my next MIM running season! Last fall we participated in The Run For Safe Haven. As a team we collected over $400 in cash donations, collected several gift cards, an suv full of wish list items, and much much more for our team philanthropy, My Sister's House. For the next 8 weeks my team mates and I will be training, spreading the word about NADA, and collecting donations. If you're interested in making a donation please contact me. I'm really excited to start running again. I know it is going to be hard at first to get back into a running routine but it is so worthwhile. Last fall, all I wanted to do was finish the race and by race day I wanted to finish in 35 minutes! This time around I hope to meet or beat that goal. I had so much fun at our last race and I really appreciated all the support and well wishes from my friends and family! 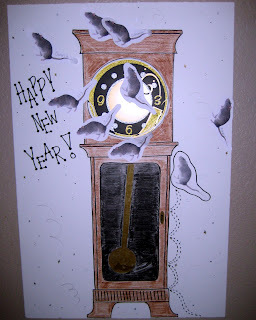 Now that I have a blog I'm going to try to write a little something each week - So keep checking back! GO MOM! 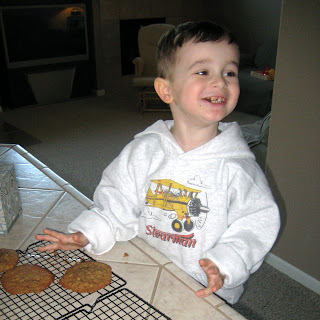 Owen stole the cookie from the cookie jar. Who me? Yes you! Couldn't be. 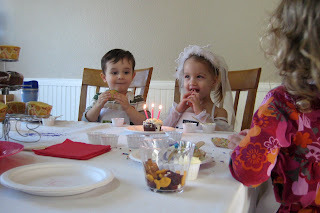 an unsolicited "I love you"
talking to your toddler about their birthday party and having him respond, "I want to go to your birthday party mama and I'll bring you candles and you can blow them out and I will sing Happy Birthday to you!" Some moments that melt me into Mama Goo! I've mentioned before that Owen and I belong to the local StrollerFit group. We love the classes and all the new friends we've made since joining! 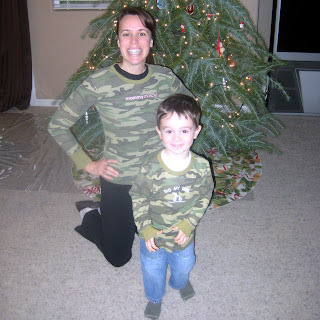 Elk Grove's StrollerFit's Member of the Month! This is such a surprise. All the moms in class are members of the month in my book! 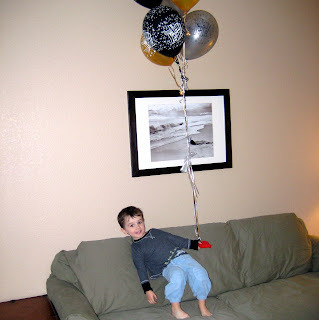 Beware of Toddlers with Cameras!!! 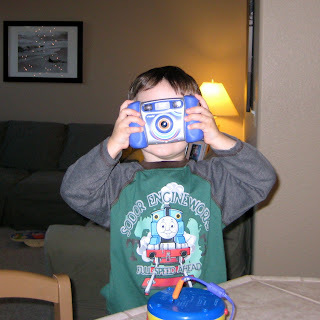 We bought Owen a kid's digital camera for Christmas. He loves taking pictures - Who does he get that from I wonder? Anyway, it is one of those be careful what you wish for gifts because I was really intent on getting the camera and now he is OBSESSED with it! He carries it all over the house and I never know when he is filming or taking a picture unless it flashes and the flash is frequently turned off. The other day I was scrolling through the pics and imagine my surprise to find a picture of myself, NAKED!!! He had walked into the bathroom while my back was turned and snapped a picture of me in the tub. SCREAM and delete! This is sweet girl Hailey, daughter of Aly & Jake, and younger sister to the beautiful Miss Taylor! Aly, Taylor, and Hailey are our girly-girl friends! 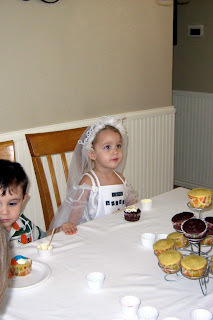 So it makes perfect sense that Hailey would insist on wearing her best dress-up dress for her birthday party! 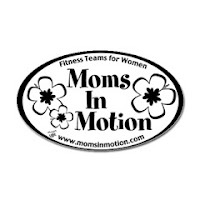 Aly and I met on the Mom's In Motion team last fall. She is an amazing photographer! You can check out her website at www.alysonviducich.com . 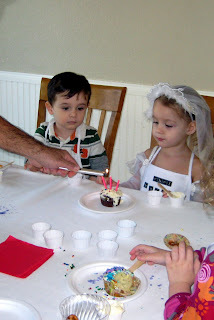 I think she should consider being a party planner too because Hailey's party was perfect! 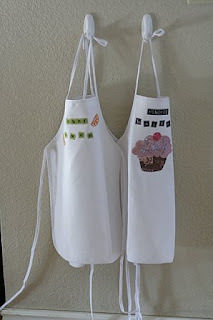 So cute and so much fun! 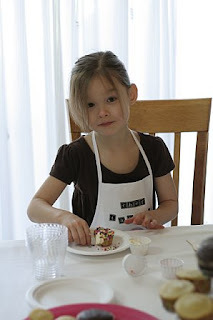 She also made yummy cupcakes for the kiddos to decorate. 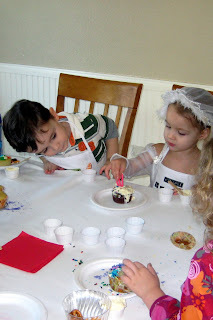 Each child had their own little paper cup of frosting and a little wooden paddle spreader. Aly also put an assortment of sprinkles in more little cups. 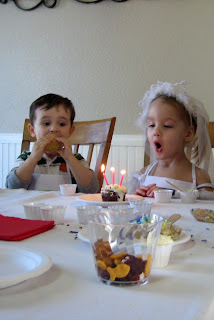 and we sang Happy Birthday to her. Watch his eyes, he never takes them off Hailey's cupcake! 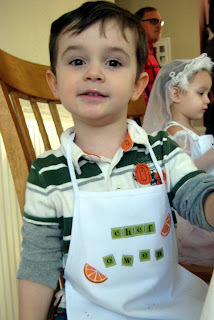 Today we hosted a Hickory Dickory Dock New Year's Party themed play date at our house for our Mommy & Me group! 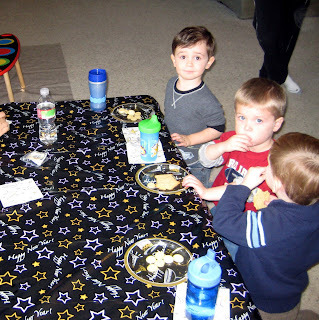 The kiddos did a paper plate clock craft, played "pin the mouse on the clock," went on a bean bag "clock" hunt, played "hot clock/potato," shared a yummy snack, and listened to a reading of the book Hickory Dickory Dock accompanied by a little mouse finger puppet! We hope everyone had a fun time, we did! I think the kiddos especially liked playing with Owen's toys in between activities. It is always so fun to check out someone else's toys! 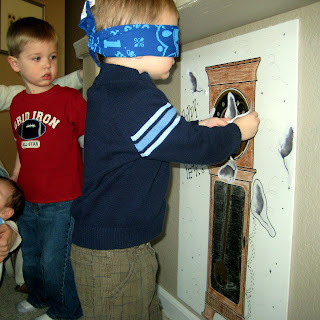 Good buddy, Lex, taking a turn at "pin the mouse on the clock"
So funny! The kiddos did a great job! 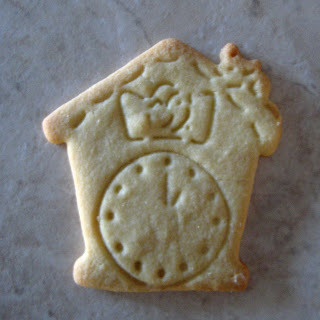 We even had Hickory Dickory Dock cookies! 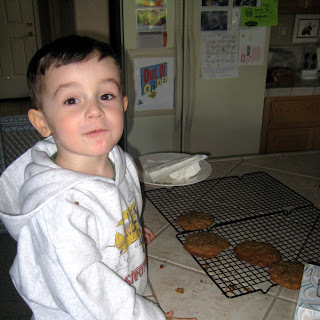 Owen helped make the cookies. cookies he said, "Because Santa is still hungry." from the Run For Safe Haven in November 2008! 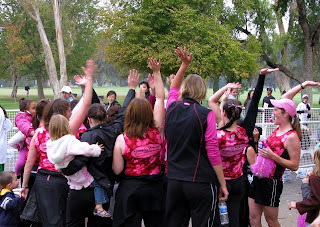 Here we are after the race doing our Mom's In Motion cheer! Wendy, our team captain is wearing the pink hat and I'm to her left with the ribbons in my braid! I'm not sure if it was my Dad or Aaron who took this picture. 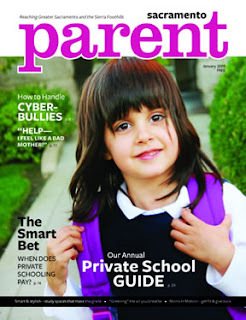 I think it is so exciting that our picture and a little paragraph about MIM is in this magazine! I surprised Aaron and myself this afternoon when I was able to lift, support, and lower my side of our mattress. We have a very large, very heavy, super comfy mattress that needs rotating every 6 months or when we remember - which ever comes first! Normally rotating the mattress can be quite a struggle for me but not today! 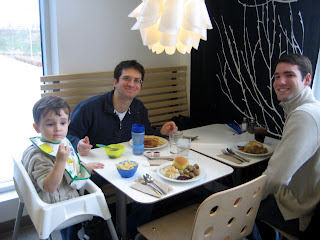 January marks the 1 year anniversary of when Owen and I joined StrollerFit. Since joining in 2008 I've dropped two clothing sizes, ran my first, second, and third official 5k, and can do my age + some in push-ups! 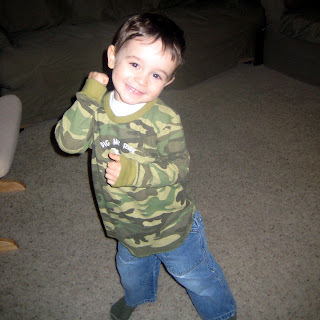 Owen enjoys running, doing bicep curls, upward rows, jumping jacks, and his own version of push-ups and wall squats! Do we have muscle? Yes we do! We can't wait to see what our next year of StrollerFit has in store for us! Owen showing off his muscle!! 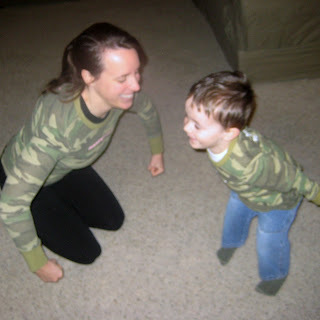 Owen & Mama playing around before going to class. 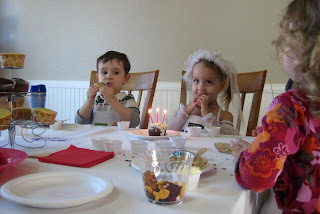 We celebrated toddler style with party hats, sparkling apple cider, and homemade soup! Owen was in bed at his usual time and Aaron and I made it to about 10pm. If our neighbors set off fireworks or made other celebratory noise we all slept right through it! 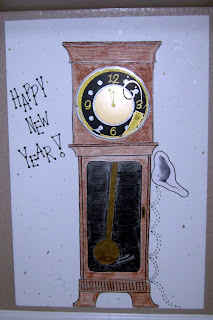 I don't generally make New Year's Resolutions since everyday is a work in progress for me, but... 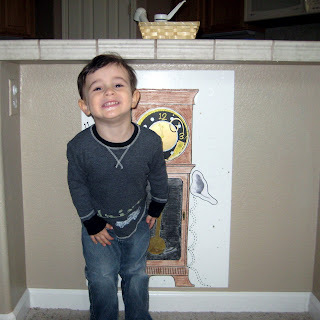 I decided to create this blog to inspire me to do a better job at keeping our friends and family up to date on what is going on in Owen's life. I've been told that blogging is addicting, I hope so! 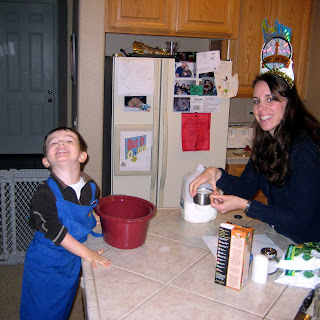 Mama & Owen making crock pot broccoli cheese soup. It didn't turn out very yummy. 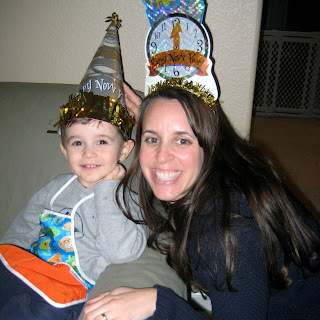 Owen & Mama modeling their party hats! 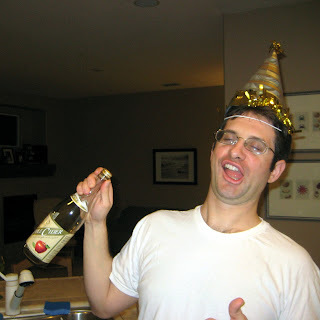 Party hats make everything more fun! from the sparkling apple cider.